Featuring world-renowned natural health physician Dr. Joseph Mercola’s dietary program in Part One and over 150 healthy and delicious new recipes in Part Two. 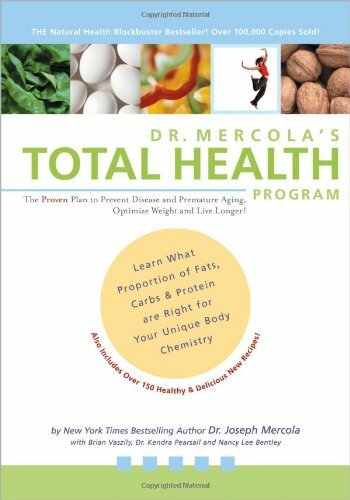 Designed to help prevent disease, premature aging, optimize weight, increase energy, and love what you eat while doing so, Mercola’s easy to follow program will help you avoid and eliminate the underlying causes of health and weight issues. Built entirely around a natural approach, including eating only the cleanest and healthiest forms of proteins, fats and carbs. Help eliminate the underlying causes for those currently challenged by diseases and conditions such as diabetes, heart problems, chronic fatigue, allergies. Dr. Joseph Mercola is an osteopathic physician and director of the Optimal Wellness Center, his medical clinic outside of Chicago. Trained in both alternative and traditional medicine, he has served as the chairman of the family medicine department at St. Alexius Medical Center for five years. Dr. Mercola is an osteopathic physician, also known as a DO. DOs are complete physicians who, along with MDs, are licensed to prescribe medication and perform surgery in all 50 states. But DOs bring something extra to the practice of medicine. Osteopathic physicians practice a "whole person" approach to medicine, treating the entire person rather that just the symptoms. With a focus on preventive health care, DOs help patients develop attitudes and lifestyles that don't just fight illness, but help prevent it, too. Dr. Mercola is dedicated to finding long-term solutions for my patients who suffer from chronic illnesses. A number of prescription medications are beneficial tools that can help to provide relief from some acute illnesses, and as a fully licensed physician he occasionally prescribes them for these purposes. However, he believes that most medications provide only temporary relief at best, and as an osteopathic physician, he seeks to treat the whole person, not just the symptoms.